M.ZUIKO DIGITAL ED 14-42 mm F3.5-5.6 EZ is the most compact standard 3x zoom lens which covers an equivalent focal range of 28-84 mm. Achieving Zuiko quality is paramount while designing for a compact form. The qualities of the electronic zoom were utilized for the outstanding usability on a standard zoom lens. 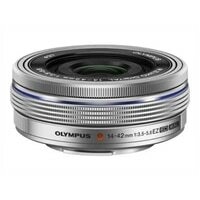 This lens is also equipped with the Olympus-original MSC (Movie and Still Compatible) mechanism, making quick and silent focusing possible when used in combination with a PEN or OM-D series camera.